Rowhedge Regatta is fast approaching on Saturday 14 June and the organisers have now sent us the Sailing Instructions which include details of both the traditional upriver race and the new downriver race which will be sailed for the Ian Brown Trophy. As you can see from the Instructions the start time for the downriver race will be announced over the PA in Rowhedge so listen out for that when you are there. If the wind holds up the plan is to finish on the BSC line, but if it is dying there is the option to finish at Bateman’s instead so look out for a shorten flag and sound signals as you come to the Bateman’s line. If we are using this line the full width of the river will form the line. 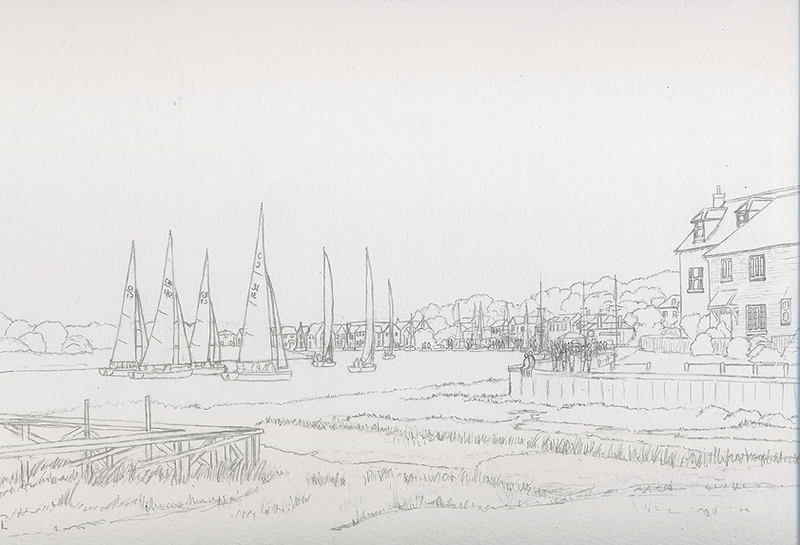 The new downriver Ian Brown Trophy is currently in production and is to be a lovely specially commissioned watercolour painting of the BODs preparing to start from Rowhedge painted by local artist Paula Webb. Below is the initial sketch of the painting so you can see what you will be racing for!